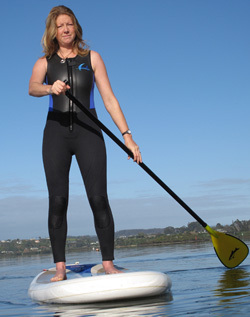 Opening in 2008, Northland Paddleboarding was the first full-time specialist stand up paddleboarding school in New Zealand. Admittedly in those early years things were fairly quiet (the sport didn't really catch on here until about 2010), but this just gave the team time to develop and refine their teaching methods, and the systems developed here are now used as a model by most SUP schools around the country. We are a SurfingNZ Registered and Accredited stand-up paddleboarding school, the only such school in the Far North. All our instructors hold the internationally recognised ISA & SNZ Paddleboard Instructor qualifications and first aid qualifications. Rather than aiming for high throughput and quick turnarounds, Northland Paddleboarding has always been about personal service and ensuring that our clients get what they need. The pace of life is slower in Northland, it's why we live here. We'd rather take a bit longer with your lesson, spend some more time getting to really understand your requirements and give you the best possible service. We're also blessed with a location that really is pretty much perfect for paddleboard tuition, at any level. Bill is the paddleboarding expert on the team. His entire life has been spent in and around watersports. He started paddleboarding in 2006, and became editor of Europe's first dedicated SUP magazine back in 2007. 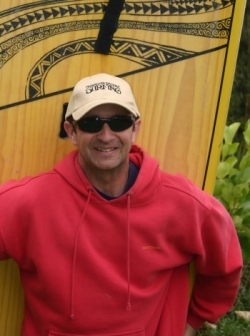 He is now one of the leading authorities on the sport in New Zealand, and the ISA (International Surfing Association) Instructor Course presenter here, in other words he trains the instructors. Bill is also part of a wider network of senior SUP instructors and trainers from around the world, regularly conferring on best practise and new SUP training strategies. 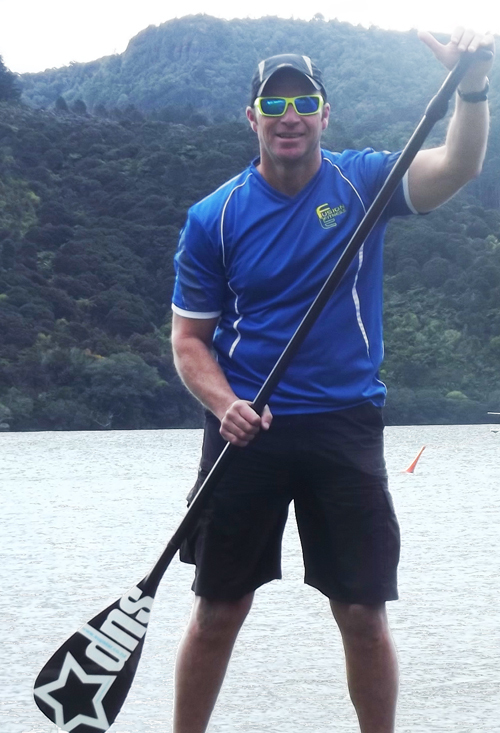 While devoted to SUP instructing at all levels, Bill's particular expertise is in the area of more advanced coaching; fine tuning people's technique to best suit their body shape, style and fitness level. Marty is the fitness expert on the team, having spent his life playing and coaching sports at many levels and over the past 10 years becoming heavily involved in training. His company 3rd Base is the result of a vision he had some 15 years ago to use his knowledge and skills to help others achieve the best that they can through sports. This vision and passion is now his full time employment and has resulted in the establishment of FUSION FITNESS (Functional Fitness Specialists), the Personal Training ‘arm’ of his company. Now qualified as a SUP instructor too, Marty will use his skills as a trainer and motivator to initially get you ‘on the water’ and then for those who want to, get you ‘cranking’ to competition and elite level. Marty offers a unique approach to his fitness programmes incorporating SUP as a foundation block of them. He's also very much a Northland man, of Ngapuhi decent with links to both Te Roroa and Ngati Wharara Hapu. Max is the education expert on the team. A highly experienced primary school teacher and a lifelong watersports enthusiast, grew up surfing in Southern California, and started 'doing it standing up' when introduced to the sport by Bill in 2008, as a way to keep fit and to get his fix in between swells. Also qualified as a surf instructor, Max now combines both of his passions and has helped hundreds of people feel what it’s like to “walk on water” with a 100% success rate. His sons, Max Lane and Jack, can often be seen cruising right alongside of him on the bay. Anna is the medical professional on the team, and of course represents perhaps the most sector of the paddleboarding market - SUP being particularly well suited to ladies, as it's so low-impact yet so beneficial. Another great watersports all-rounder, Anna surfs, sails, swims and SUPs, and qualified as a stand-up paddleboard instructor in early 2012. We run a mobile school - rather than being bound to one particular place we go to where the conditions are most suitable. The Kerikeri Inlet offers a variety of launching venues, so that whatever the wind and weather we can be sure to find somewhere sheltered and safe, or more challenging if appropriate. It also has some truly amazing 'secret spots' that still take our breath away even now, whenever we visit them.